We (yours truly, John Monteverdi, and Thom Trimble) arrived at Denver International Airport on Friday evening, May 17. We decided to spend the night in Boulder since it is picturesque town and the running is great there. On May 18 we hoped that a Denver Convergence Zone would develop and that dew points would recover sufficiently to allow for storms with low bases and rooted in the boundary layer. Instead, although the DVCZ did indeed develop, the dew points brought northward were low, and all we got were elevated storms drifting off of the Rockies. Well, we got a great run in up the trail along Boulder Canyon...very scenic with lots of sheer canyon walls around. (Note rock climbers on the top of the cliffs in the background). We took the opportunity to visit the National Center for Atmospheric Research and take in the displays. We are spending the night in the Colorado Springs area (Manitou Springs). The progs are encouraging for the early part of the week, perhaps Tuesday, though whether we will be heading north or south is a question now. Meanwhile, we are hoping to get some lightning shots over the next several days, since a little bit of buoyancy will allow for mountain thunderstorms to develop each day. We awoke in Manitou Springs to the second consecutive Denver cyclone...but working with very low dewpoints. Once again, we took the opportunity to get another great run in...this time in Garden of the Gods. Afterwards, in Colorado Springs, we decided to head southeast to Lamar, Colorado, hoping to get a lightning show tonight....so we will see about that. With meager buoyancy to work with, an incoming short wave passing over SW Colorado stimulated many, but mostly weak, thunderstorms (with a few exceptions). However, the coverage and intensity of storms was greater than that of yesterday....several storms nearly became severe. 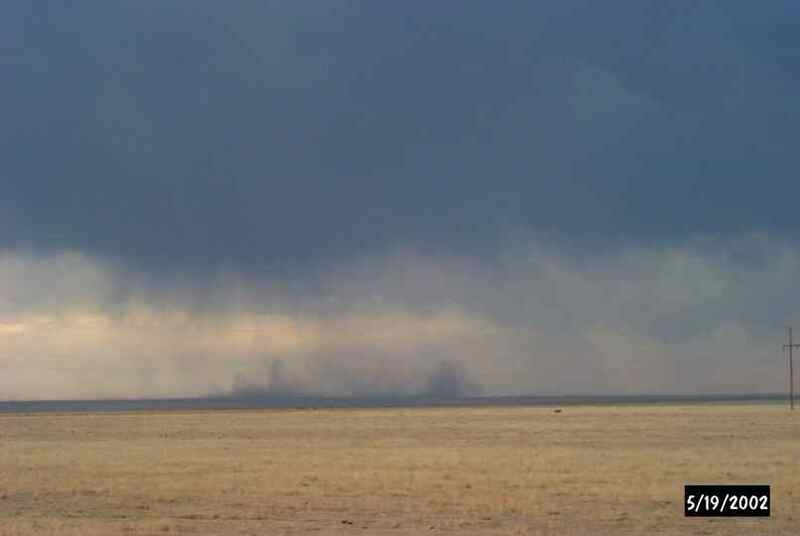 This storm developed a microburst and spread dust upwards and outwards. Over the next 48 hours, shear profiles become better....so we are looking to the Gulf of Mexico, hoping that moist air works its way northward. The next day, shear profiles in eastern Wyoming were expected to be dynamite, ahead of an ejecting short wave that had clobbered California. Unfortunately, an otherwise tornadic pattern was moistureless. 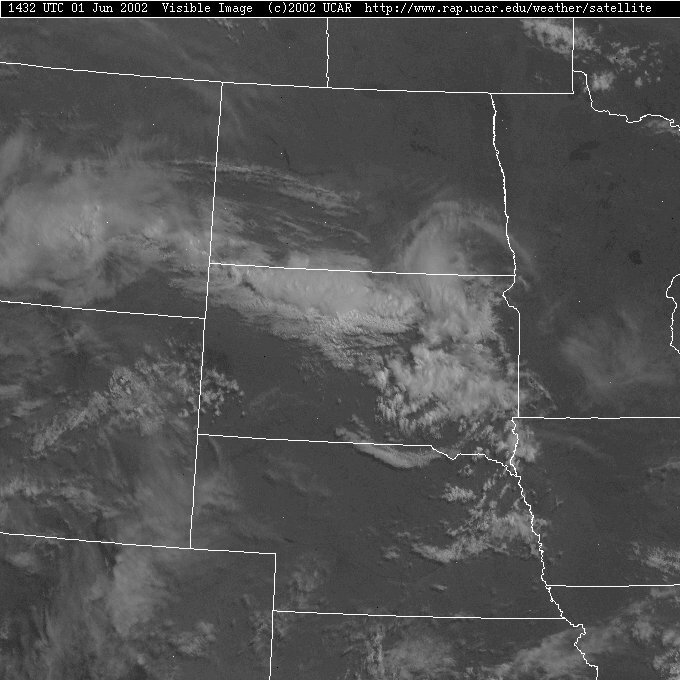 The result was a series of storms that developed in the Wyoming Rockies and drifted eastward. 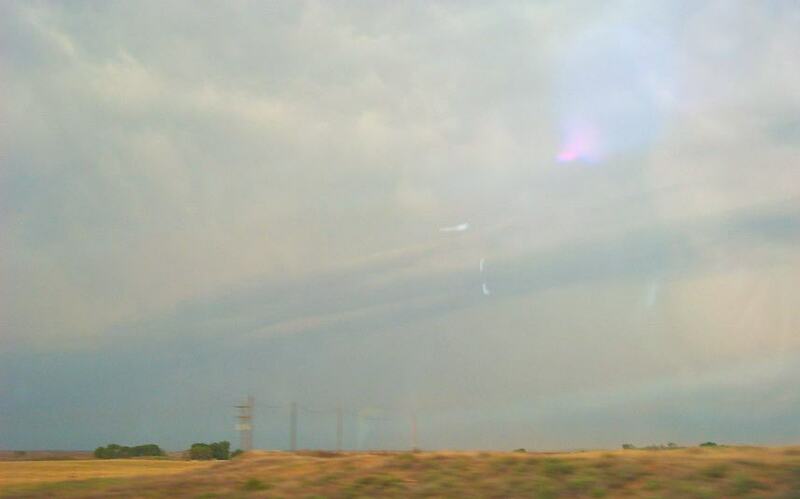 We targeted the area north of Cheyenne and saw some high based storms with a large shelf extending outward to the east, but no structure to speak of. 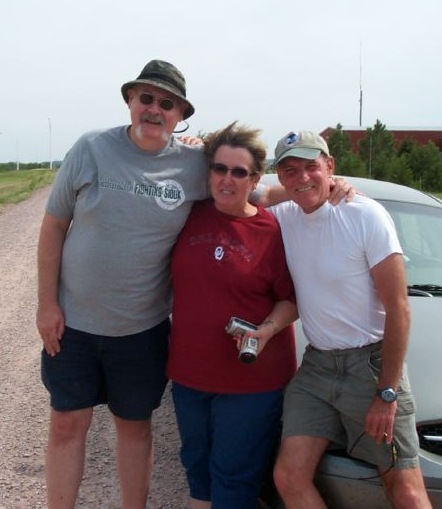 We driftted east into Nebraska that evening and got pummelled by 50-70 mph winds in the Nebraska Panhandle. These winds were southeasterly winds rushing into the monster low to our north....but with no moisture, only weak thunderstorms resulted. The strong winds lifted the moulding on our windshield. Eventually, we had to have the care replaced. After spending the night in Kearney, Nebraska, we drove southward to get south of the cold front that had advanced into the western part of Nebraska and advanced, eventually, into north-central KS. Finally, high 50 dew points had worked their way northward from the Gulf! But would it be enough to initiate storms in the area of favorable shear for tornadic supercells in the area between Pratt and Wichita? Nope! 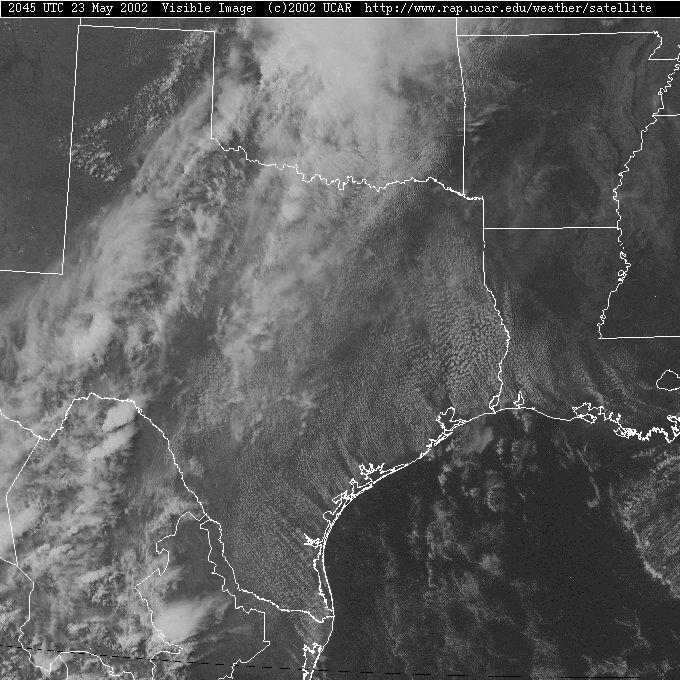 But enough moisture had pooled ahead of the cold front to generate some weakly rotating storms. 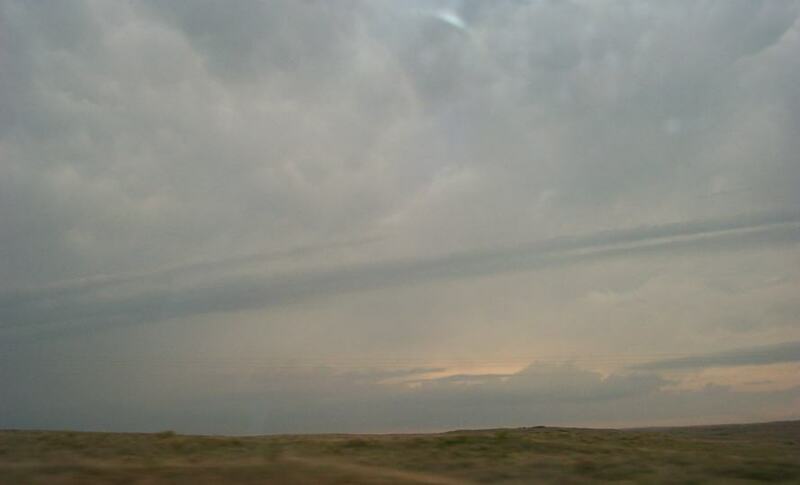 We saw the first north of Russell, KS. 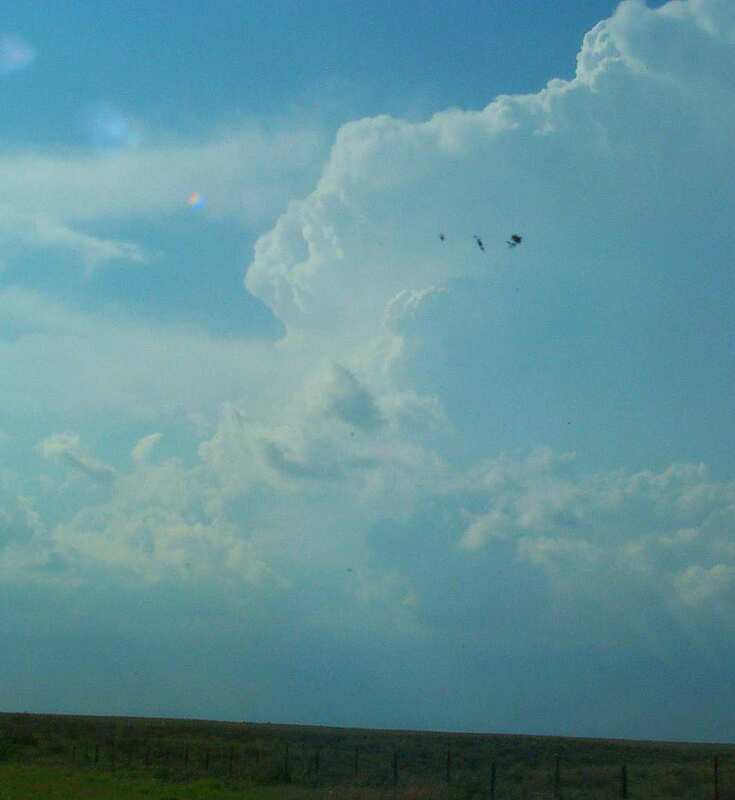 Later, we chased a couple of storms north of Hays that exploded in the late afternoon. These storms had some weakly developed structure...a couple of developing wall clouds that had some rotation and a nice base, albeit, with weak rotation. However, there were some great downbursts and ominous lowerings. There was also one radar-indicated tornado that stimulated a warning for a storm north of us. We are in Russell KS tonight, and are aiming for the Oklahoma border area north of Enid and south of Pratt tomorrow, an area expected to have both buoyancy and favorable shear tomorrow....hopefully. We started the day in Russell, KS, eyeing the area between Enid and Woodward, south of the cold front that had moved southward from Nebraska overnight. In our target areas, finally, 60 degree dewpoints had returned. 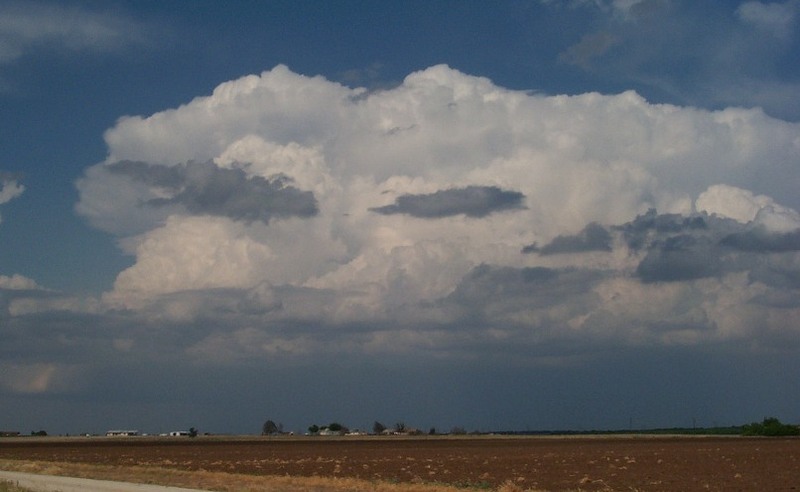 However, while driving southward we noticed many high based thunderstorms in our target area. 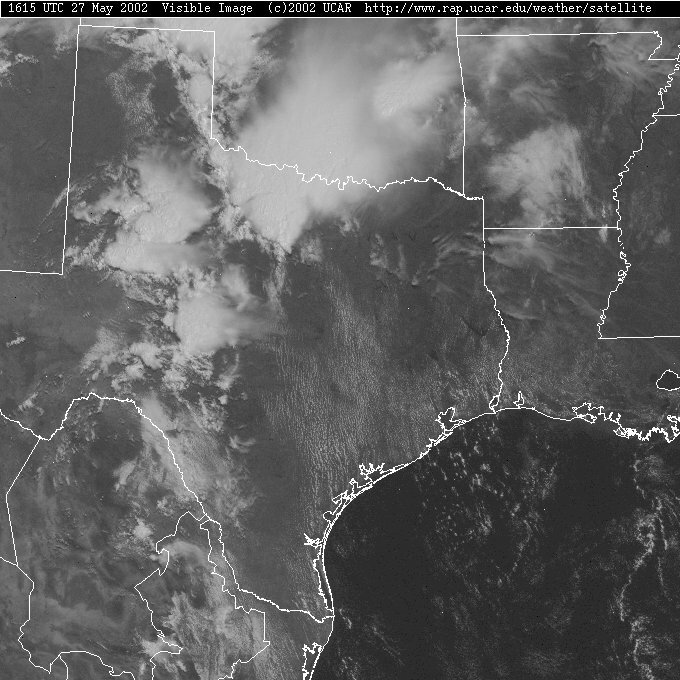 Outflow from these storms messed up northern Oklahoma and spread into the Texas Panhandle. There, a combination of complex boundary interaction, the dry line and favorable deep layer shear suggested that at least there was a risk of supercells...although the tornado threat was expected to be not significant. 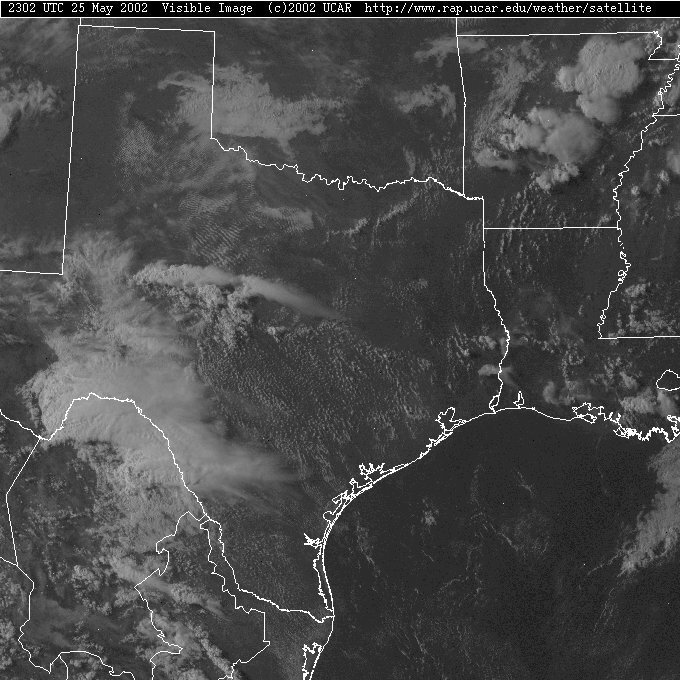 We downloaded this image, which showed a cumulus field in the Texas Panhandle, and thus drifted west from Woodward towards Canadian. 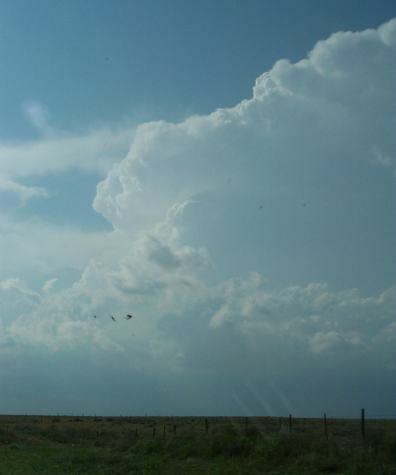 By the time we drove 50 miles, a huge storm developed in the northeast Texas Panhandle near Follett. This storm blossomed a solid anvil, with updrafts building into the main growing tower...a sure sign that this thing was a supercell. By the time we drove 20 miles north, we noticed a wall cloud underneath the main updraft. This cycled several times, disappeared and then gradually reappeared as a bulbous, and large, rapidly rotating wall cloud. Two things happened in rapid succession. First, around 6:15 PM, a weak tornado formed about a mile from us, but dissipated before I could get a digital (although I should have it on video). At around 7PM, a weaker tornado formed on the distant northwestern edge of the wall cloud. 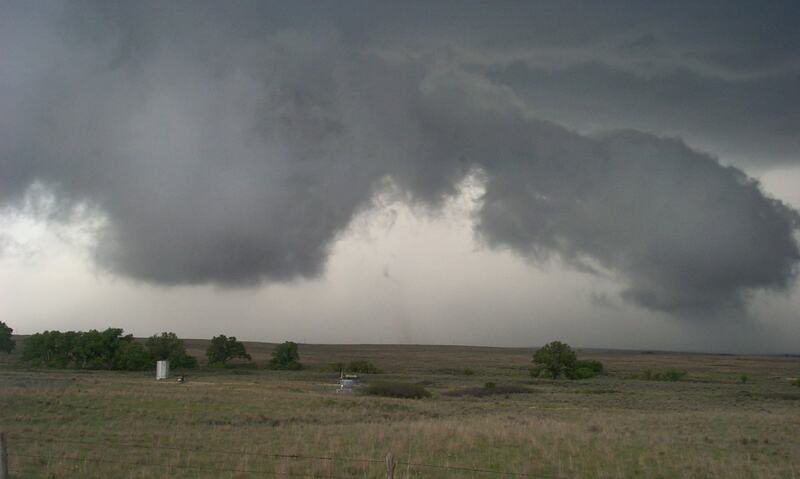 We documented several rapidly rotating vortices, at a smaller scale than the parent wall cloud. But, the major tornado we had hoped for never developed. Shortly after this, the storm became outflow dominant, and dissipated quickly. We drove westward and noticed another supercell...with a brief rotating wall cloud, but this also dissipated near sunset as the major supercell of the evening was developing near Borger. 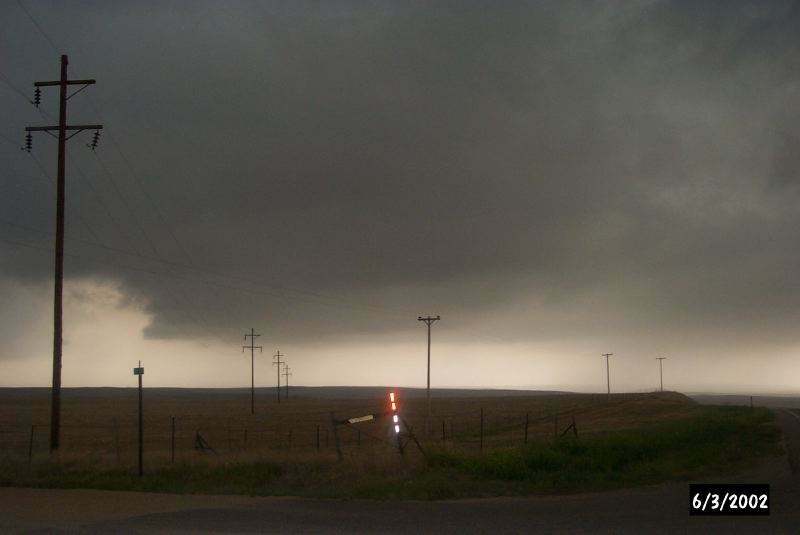 Unfortunately, this occurred when the digital camera did not have enough light to take imagery...although on our way to the storm we did capture a few of the many inflow bands or cigars that all seemed to be drawn into the main Borger storm. 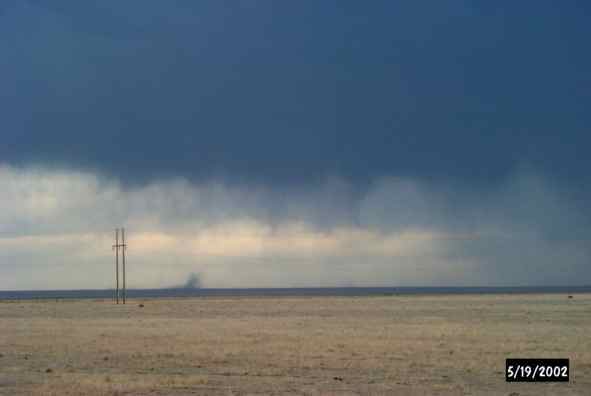 The Borger storm was a massive bell shaped lowering, with the largest "Beaver tail" that I have ever seen. The cloud structure had deeply cut and sharply defined striations...in shades of purple and deep green, set agains the bluer colors of the cloud mass at sunset...all illuminated by frequent cloud to ground, anvil crawling and in-cloud lightning. This radar animation shows the Borger cell along wiht a number of others that had developed after sunset. Note the hook echoes.. Analysis of the video shot by Jay Antle (Mike Umscheid's video is similar) possibly shows a large, well-defined wedge tornado in the occluded part of this storm near Pampa (annotated image). We were standing right near Mike and cohorts, but did not see this feature...nor did they until they looked at their low-light video (881 kb). The tornado may have been 1/4 mile wide and, had it been in an urban area, probably could have caused great destruction. (Images posted with Jay and Mike's permission). The pattern on May 24th looked great. The morning surface plot showed a large surge of moist air into western Oklahoma east of the dry line. The afternoon forecasts suggested that north Texas and sw Oklahoma would continue to have favorable CAPE, with a focus somewhere north of Red River. Morning soundings and hodographs from the area (modified for conditions in sw Oklahoma) suggested great potential for tornadic supercells and SPC placed the region under a moderate risk. We chose the area of sw Oklahoma because that region would have favorable shear (we thought) and south of the cold front surging southward through western Oklahoma. The area around Hollis would be in favorable shear, ahead of the dryline and south of the cold front (the so called "triple point"). The first storm that moved into the area briefly showed promise. 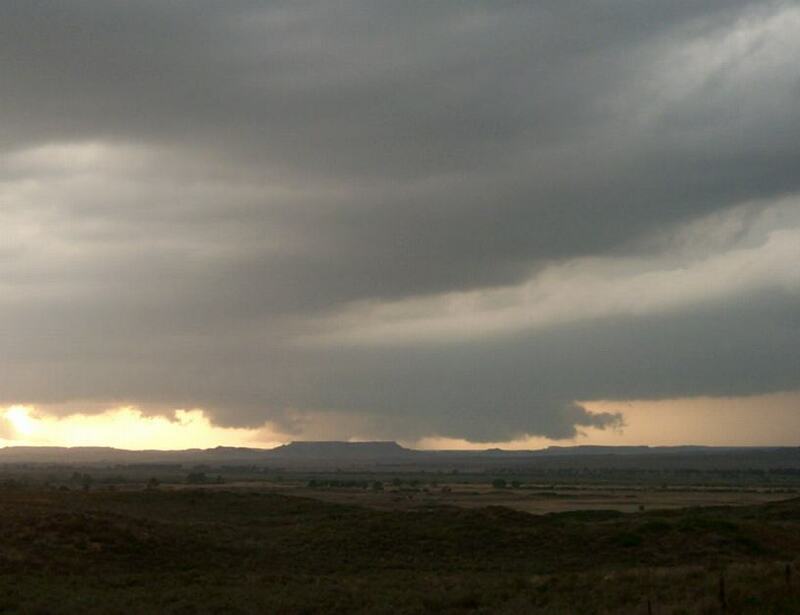 It briefly developed a bell shaped lowering, beaver tail, wall cloud and was clearly rotating. But it rapidly became undercut and split. The split indicated that the shear profiles were not what was forecast. In fact, storms seemed to move in all sorts of odd directions on this day, with one coming from the due south, our first storm merging with storms further north, and another set of storms catching up with the first. All the storms clearly rotated, but all became undercut with cold outflow. All the storms also briefly showed structure suggesting their early potential, but all inevitably became outflow dominated. 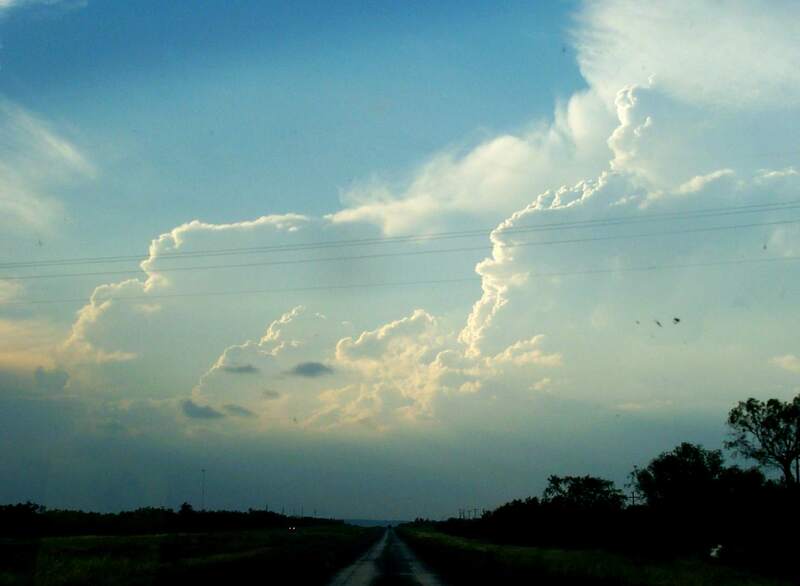 We finally gave up on the main updraft of the last set of storms near Altus (note the blue-green color) around 7PM. Storms in Texas just to the south had tornado warnings on them, but these storms were actually in less favorable deep layer shear. However, the directional shear ended up being better in that area (in other words, although the difference between the winds aloft and the surface winds was less favorable, the clockwise turning of the winds with height was more organized and favorable for classic supercells, albeit brief ones). We heard a tornado warning for a multi-vortex tornado on a storm just to our south, but later reports indicated that its duration was about 10 seconds. We chose the minimal risk area of west Texas on Thom's last chase day. The front that had been sagging southward and taking us with it since Wednesday finally came to a screeching halt in central TX. 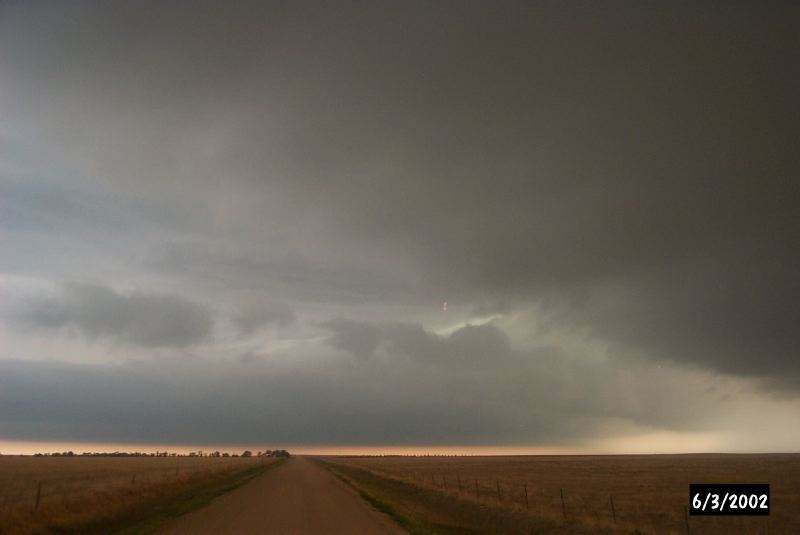 South of the front, very moist air produced large CAPE, but the shear was very unfavorable for supercells. We watched one storm organize near Ballinger. It had a pretty look for a while, but soon joined with other cells near Robert Lee (north of San Angelo) to form a complex of flash flood producing storms. We drove northwest along the northwest side of this complex to Odessa. There we saw a magnificent storm that had come off of the Davis Mountains. 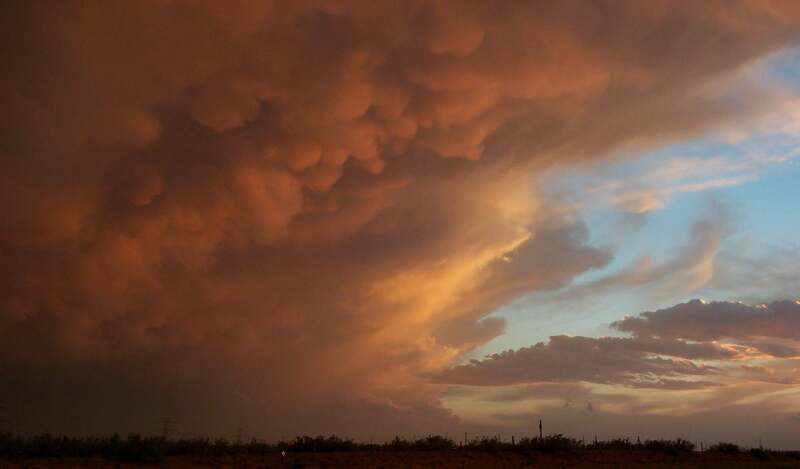 It had a spectacular display of mammatus. Then we watched the lightning show for a while...by the time we got our cameras on tripods, the prolific explosion of strikes had decreased to just a few. This was Thom's exit day from Midland airport. Fortunately, it was a day with minimal risk of tornadoes. 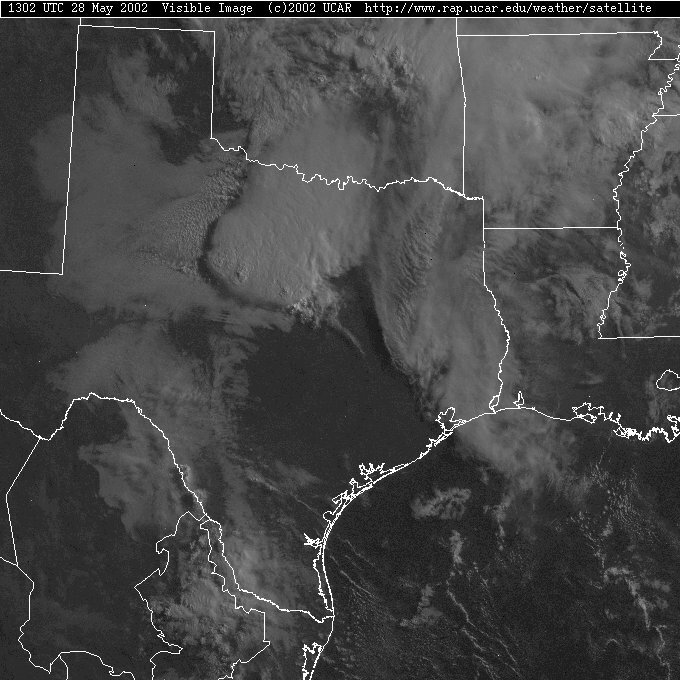 There were thunderstorms in the area, and a supercell did develop further south by about 100 miles. But, for me, this was basically a down day. I used this day as an opportunity to turn in the Maxima to the Hertz outlet at Midland airport. The car had sustained slight damage around the windshield in our drive through the Nebraska wind storm 5 days ago. Because the Hertz outlet di d not have a Maxima, they provided me with yet another upgrade, to a "premium" car, in this case a Mazda Millenium....chasing in style!!! possible weak tornadoes near Lubbock! The morning analysis showed several outflow boundaries in the eastern Panhandle south to the south Plains, all of this indicated by the cloud features. Between these features and the dryline in eastern New Mexico, dew point temperatures were high and CAPE values indicated more than adequate buoyancy. Meanwhile, a short wave coming out of the southwest was to be timed just properly to destabilize things further and to provide a proper shear profile (already good) for supercells. 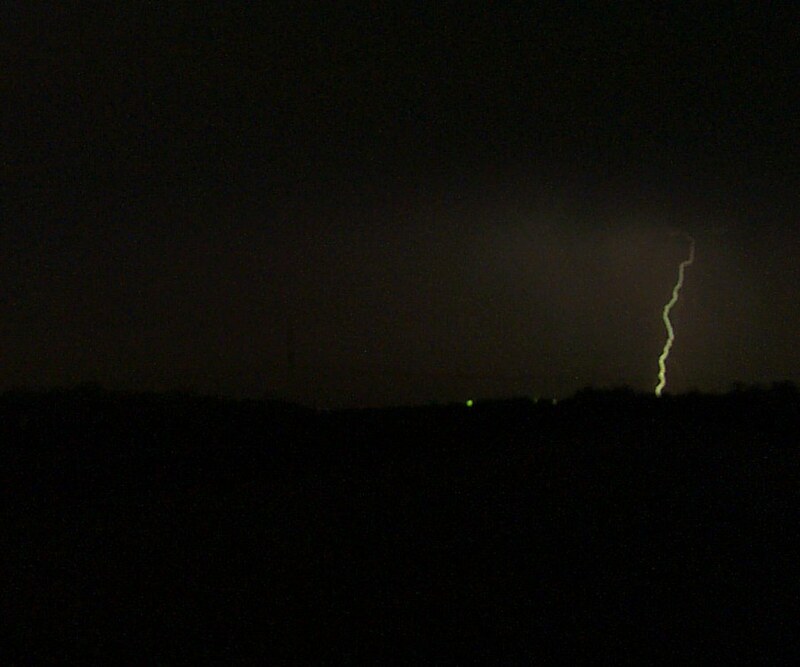 I was now chasing with colleagues Mike Umscheid, Matt Crowther and Jay Anlte and we targeted the region northeast of Lamesa. By the time we got into that area storms had already developed...including one with a tornado warning. We targeted a cell that developed to the south of that and intercepted it near Crosbyton. There we noted a few possible tornadic dust whirls, one of which prompted a tornado warning. 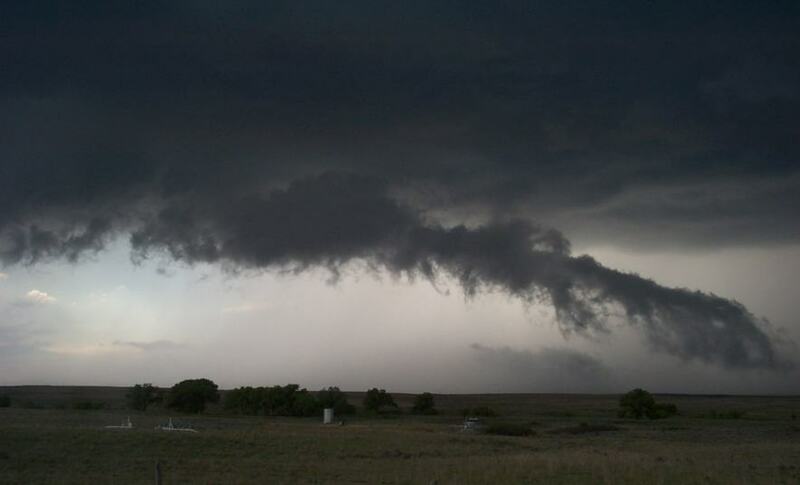 The base showed a rear flank downdraft on its back side and the storm structure suggested a strongly rotating supercell. The storm quickly cycled down but we noticed another storm on its west flank. It turns out that this was the storm of the day. When we arrived it had a blocky lowering underneath a stout updraft exploding into a backsheared anvil. Underneath the wall cloud tornadic whirls were occurring consistently for 15 minutes, and several tornado warnings were issued for this storm...but apart from features that looked like tornadoes, and the aforementioned dust whirls, we did not see any significant tornadoes. After a precipitation core punched through the wall cloud (suggesting that the shear profile was messed up), the storm cycled down quickly. 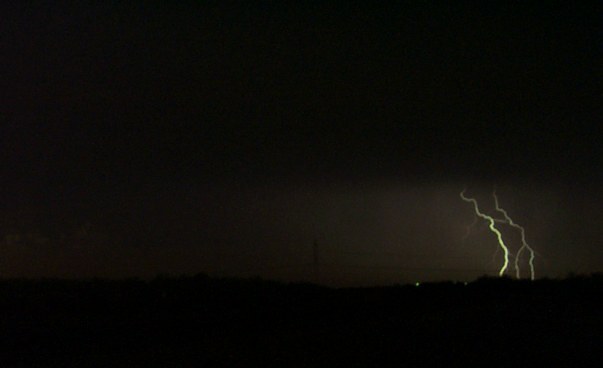 It still was active east of us, while a weak squall line formed northwest of us in the setting sun. We spent the night in Lubbock after a very satisfying chase day....two strong supercells and several possible weak tornadoes. The morning analysis showed a tongue of high dew point temperatures west of an outflow boundary and south of the synoptic scale warm front from Midland area southward into the upper Pecos River Valley in West Texas. 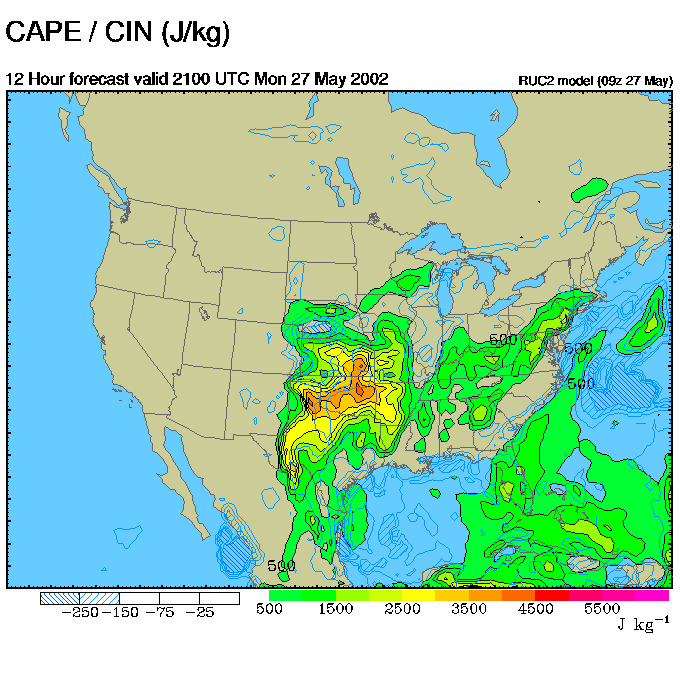 CAPE values were expected to be in the 3000-4000 J/kg range in this area...and they did not disappoint. The negative factor was very weak deep layer shear. Initial storms formed west of Midland and immediately split....this shows the left mover, which was actually severe at the time of this picture. A series of storms formed, and each split. We knew that for whatever reasons, supercells were occurring since splitting is inherently a supercellular process. Each of these storms became severe, with the chief hazardous weather occurrence very large hail (~2.5 to 3 in) and wet microbursts. The storms had magnificent anvils with mammatus. Storm propagation was to the southwest, a motion that really favored anvil relative flow and storm relative flow favorable for supercells. 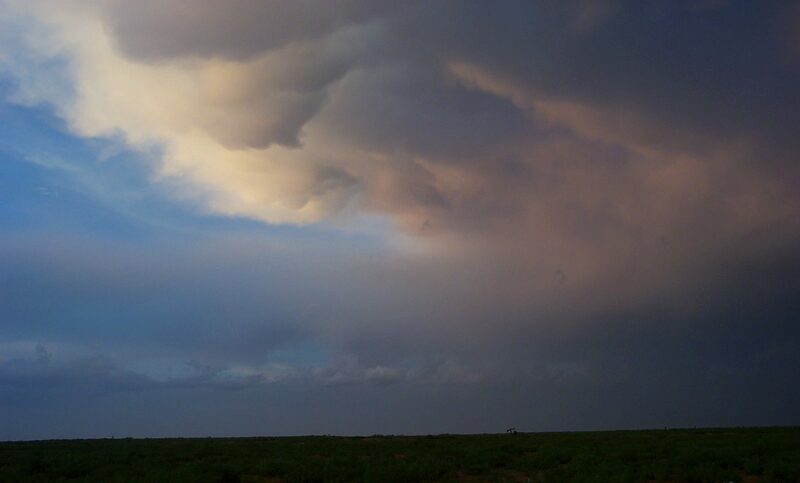 We chased this one half way to the Rio Grande River...note the bell shaped base and tail cloud (view looking towards the southwest...not the best place to be...but we had no hail). This storm generated a tornado warninig as we watched it but did not see a tornado...although we did see a funnel cloud on the occluded mesocyclone nearly directly over our heads. 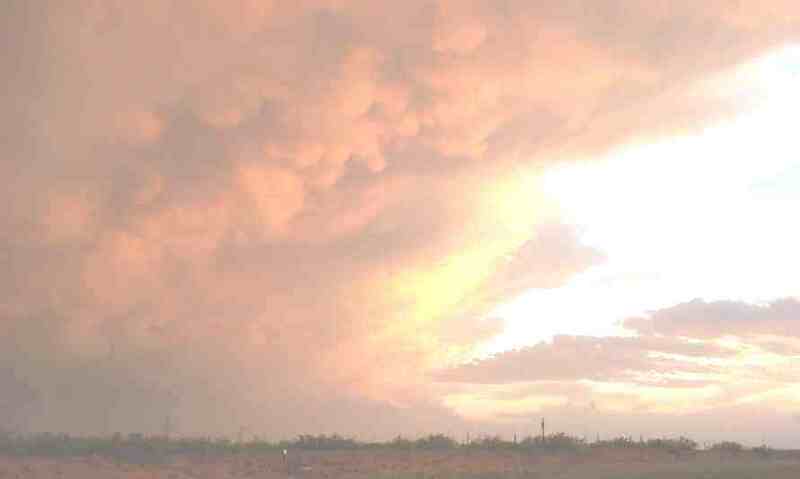 In the evening light we can see the exploding updraft and backsheared anvil of this tremendous storm as it progressed southward to Big Bend National Park well south of Ft. Stockton. We spent the night in Pecos. A down day...used to move northward to Nebraska for Friday's forecast pattern. 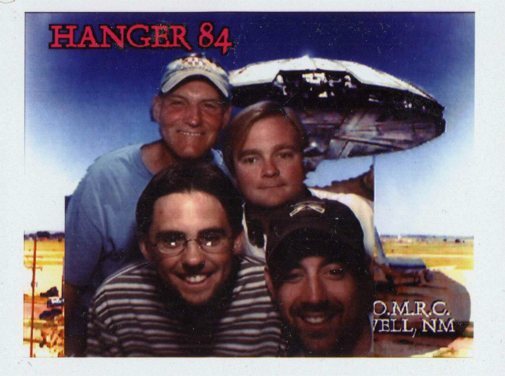 Here is a picture of me with Mike and Jay at the UFO museum in Roswell...and here are Mike and Jay with their friend Rob Mitchell. The answer may be out there but it is not at this museum. We are spending the night in Trinidad, Colorado...tomorrow I join up with Chuck and Vickie Doswell. 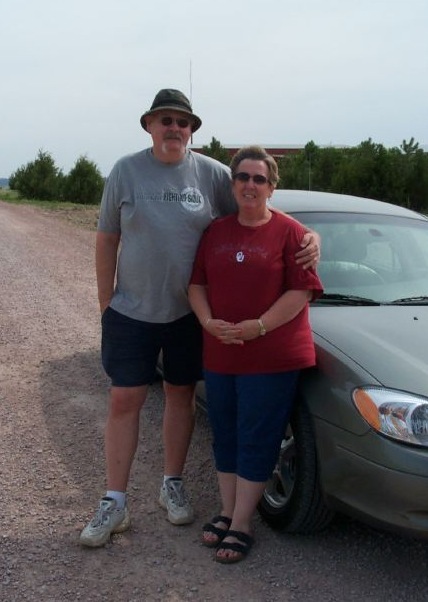 On a down day I drove up to Scottsbluff, Nebraska to meet up with Chuck and Vickie Doswell, my chase partners for the last part of my trip. 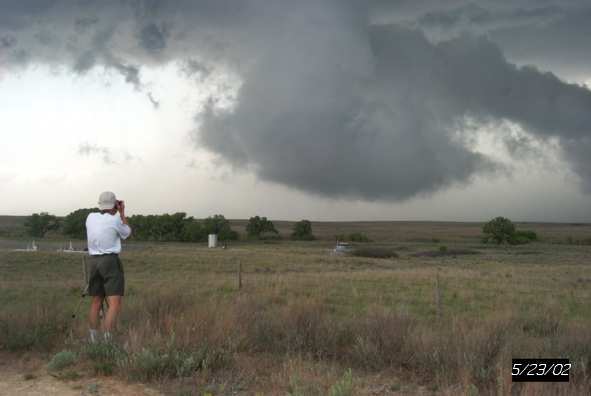 One of the great benefits of storm chasing is the interaction with learned colleagues. For the last three years I have had the great privilege of chasing with one of the "founding fathers" of chasing. 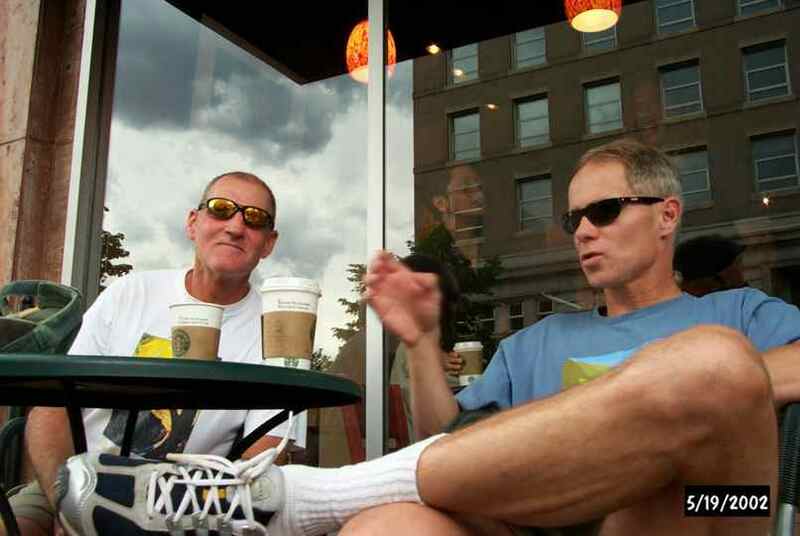 I met Chuck in 1987, and the friendship that has formed has been rewarding professionally. More importantly, the personal friendship between us is one that I value greatly. I met Vickie three years ago and became fast friends too with this charming lady. It is always a treat to be with both. Unfortunately, the pattern was not to cooperate with our mutual desires to see either tornadic storms, or storms with excellent structure. The major "fly in the ointment" for this trip was a pesky set of tropical lows in the Gulf of Mexico that essentially "shut off" the flow of tropical air northward into the Great Plains. There were no true "tropical" trajectories of air and we were hard pressed to find dewpoints in the 60s.There was no exception on this day....that featured a subsynoptic low pressure area in northwestern KS. Normally, the boundary between the southeasterly winds on its east side and the easterly winds on the north side should have been a focus for the development of severe, possibly supercellular, thunderstorms. However, dewpoints barely got into the 50s and the air mass was strongly capped. No initiation occurred. We stayed in North Platte that evening. The pattern the next day was basically similar, except that deep layer shear was more favorable for severe storms. Flow favored upslope trajectory of air with marginally good dewpoints (low to mid 50s) into the Nebraska Panhandle. So we drove north from North Platte to Valentine and then west to Chadron where we hooked up with noted chaser, smart aleck, Field Coordinator for STEPS and colleague Al Pietrycha. We hung around in Chadron waiting for the developing cumulus field in southwestern South Dakota and northeastern Wyoming to blossom. Storms eventually did fire, but were only weakly rotating. We spent the night in Scottsbluff after being joined by Brian Curran and Ed Calianese (darn, no pictures of these fine fellows). This day was to be one of our most frustrating. SPC had a moderate risk for the region of ne Nebraska. This was on the opposite corner of a very large state. The pattern showed a strong boundary in that portion of the state with very unstable air, potentially, just south and along the boundary and reasonably good deep layer shear above. However, the same problem with marginal dewpoints meant that a very strong cap would have to be overcome. We drove that 600 miles and found a spectacular boundary--a 20 degree gradient in temperature from Norfolk to Yankton, SD. However, no storms formed...and we settled down for the night in Norfolk with the grim knowledge that the next day would feature an even more horrendous drive back to eastern Colorado. The pattern the next day looked somewhat favorable in eastern Colorado. Models suggested upslope flow in marginal shear and buoyancy developing chiefly from the I70 corridor southward. We got there somewhat too late to see the initial stages the large supercell that briefly produced an unverified tornado. We did get to the Limon area in time to nearly be swallowed by the maw of this purple beast as it morphed into a very large HP supercell that munched cars on the interstate with 1 1/2" hail (sorry, no pictures...as we turned tail and ran from this thing). 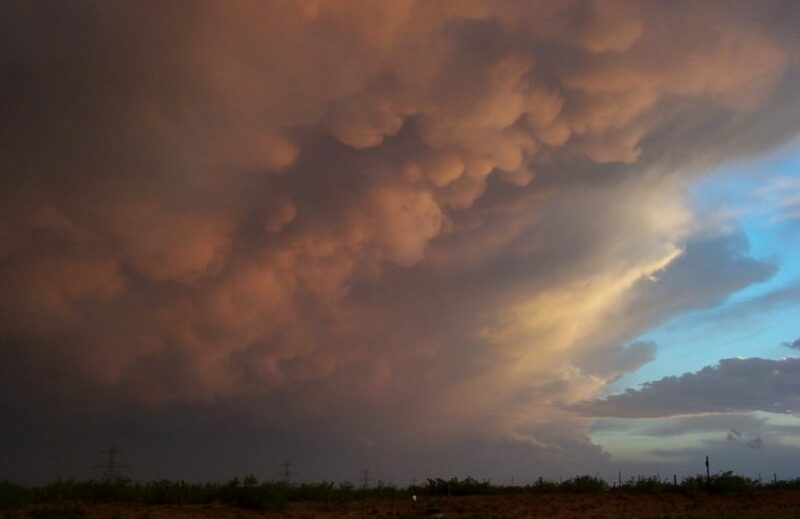 By late afternoon, most of eastern Colorado was covered with scattered thunderstorms, some of them supercells that had tornado warnings on them. but none seen by any human eyes (mainly, because there were no tornadoes on this day). Our little group split up at this time...since Chuck, Vickie, Brian and Ed would be in Texas the next day, while Al and I had to go in different directions on our homebound journeys. As I drove back toward Limon, I encountered what I thought was a "mini" HP supercell west of Limon, for which a tornado warning had been issued. As I neared it, I could see a base of some sort. And, as I got too close, I found myself looking into the notch north of the beaver tail and south of the forward flank rain core (view looking southwest) with some rotation obvious in the rain-wrapped mesocyclone. The storm weakened rapidly at sunset. This was my exit day. No chasing. I would like to thank my regular chase partner, Thom Trimble, and Chuck and Vickie Doswell for a time well spent. 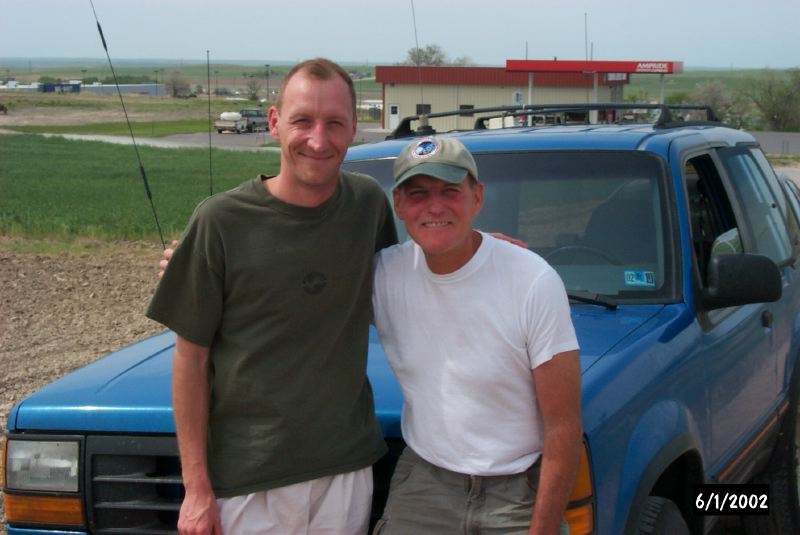 Other chasers that contributed to my education and fun this journey included: Jay Antle, Ed Calianese, Matt and Betsy Crowther, Brian Curran, Al Moller, Rob Mitchell, Al Pietrycha and Mike Umscheid. 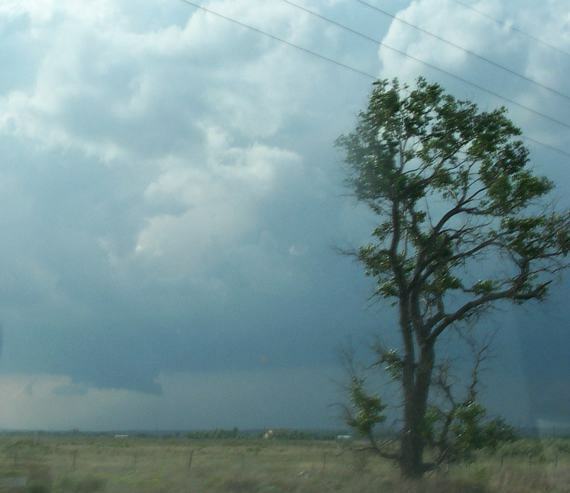 There were many other chasers that we encountered along the way, too numerous to mention. So long until next year.